The fall session just wrapped up but spring is right around the corner, follow the ACES Coding Club Blog for information about registration dates and more! 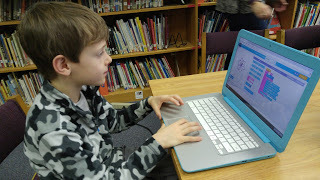 Abbotts Creek Coding Club is open to all ACES students in 2nd-5th Grade. Students will use code.org Code Studio which is a fun, creative platform for learning basic coding and computer science! Using a blended learning model, children are learning with a mix of online activities (on the computer) and “unplugged” classroom activities that do not use a computer. Want to see what it’s all about with a Frozen or Star Wars game? Go to code.org and try it out.